FWD50 is a digital government media organization whose primary activity is the organization of the annual international conference, FWD50. We take privacy very seriously, both as a topic at the core of our events and activities, and as a fundamental tenet of how we run our business. We promise to transparently share all aspects of how the FWD50 website works in regards to privacy, terms, and personal data, and to act as strong proponents of your right to data transparency, digital freedom, and online protections. 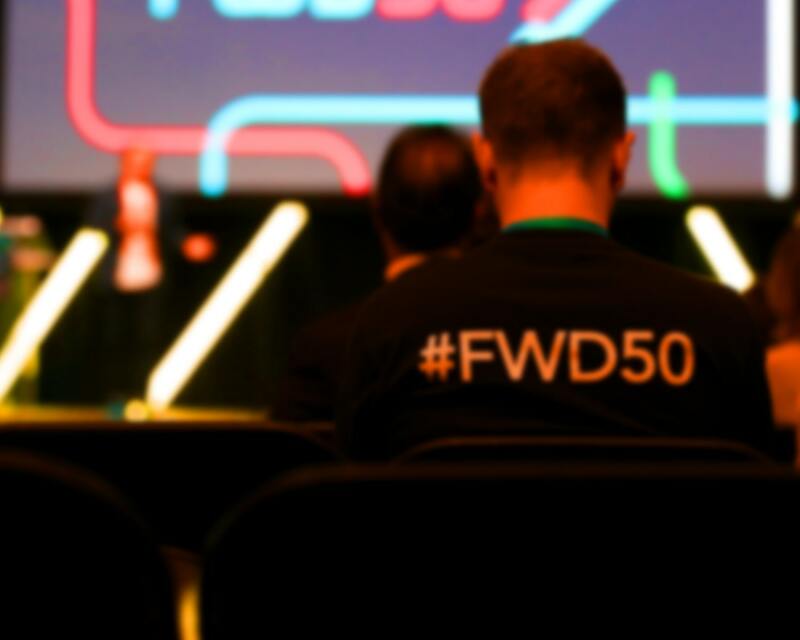 By visiting www.fwd50.com (the “FWD50 website”), contacting us, or agreeing to receive emails from FWD50, you accept the terms and conditions of this policy. This policy does not extend to websites operated by third parties. FWD50 has no control, and cannot be liable for, third-party privacy policies, procedures and practices. We collect your personal information in a number of ways, including when you sign up to our newsletter; apply for a contest; propose a talk; offer to volunteer at an event; follow us on social media; complete a webform; register for an event operated by us; etc. Depending on the circumstances of your engagement with us, the personal information we collect may include your name, your contact information (street address, electronic address, telephone number), your gender, your age, the industry you work in, your method of payment, and other information. We also collect data relating to your visit to the FWD50 Website. This information may include your IP address, the date, time and duration of your visits, as well as the web pages you visited. These cookies cannot be used to extract personal information, and the information stored in cookie format is not related to any other data that can identify you. Disabling cookies on your browser will not adversely affect your browsing experience on the FWD50 Website. We use tracking pixels on our website that allow us and our partners to market future events, products and services through websites such as Facebook, Twitter and Google. Disabling cookies in your browser, or not accepting cookies when prompted by our website, will disable all tracking pixels on our site. We commit to displaying a list of all current sub-processors in use by FWD50. A sub-processor includes any third party that we may share or store personally identifiable info with. However, to make sure that the personal information we maintain about you is accurate and up to date, please inform us immediately of any change in your personal information. See contact details below. The European Union’s General Data Protection Regulations (GDPR) took effect May 25th, 2018 and we are fully behind the spirit of these regulations for a safe and secure Internet. We aspire to embrace privacy by design and, whenever possible, to not collect and store personally-identifiable information. Overall, we aim for privacy by default: If data collection is not integral to your engagement with FWD50, then we won’t collect it. Absolutely no personally-identifiable information is shared with any partner, sponsor, or third party, unless such sharing is clearly stated and individuals have accepted the sharing of their information through a straightforward opt-in process. In the case where opt-in has been granted for the sharing of information, it is up to the third party to assure they adhere to all legal standards of data privacy. They are also obliged to confirm opt-in preferences with all individuals the first time they communicate with them, and allow the individual to opt out at all time. We are continually auditing all areas of FWD50 to determine what personal data we collect and for what purpose. We have added a cookie notice to all FWD50 webpages pages and blogs in order to comply with the E-Privacy Directive. We do not collect personally-identifiable information with our cookies, but we do want to acknowledge the use of cookie technology on our website. Anyone who has ever attended our event, joined one of our mailing lists or applied for a contest, has the right to request that we delete all of their personal data. Anyone who wishes to inquire about the right to be forgotten will be able to reach out to us at any time. Get in touch below. Anyone who has ever attended our event, joined one of our mailing lists or applied for a contest, can request access to a copy of the personal data that we have collected. Anyone who wishes to request portability can reach out to us at any time. Get in touch below. Anyone who has ever attended our event, joined one of our mailing lists or applied for a contest, can ask to change their information, and we can do so. If anyone has a modification to make, they can reach out to us. Get in touch. We are in the process of creating a legal agreement that anyone can receive from us, promising the protection of all personally identifiable information that we collect and store.